Last week I was rambling in Besiktas, one of the most famous districts in Istanbul. I entered one fabric store. I was looking for a 100% linen or cotton fabric. I needed a thick fabric to refurbish a rescue chair. It should had been a natural fabric because I wanted to paint and stencil on it with acrylic paints. My visit in that shop was such a pleasant shopping experience. The seller, an old and experienced man, told me so many and useful informations regarding fabrics. I am a very choosy customer, that type of buyer that not many sellers would love to see often. I like to ask many questions, change my mind in 5 minutes. I think I had half of the fabrics in the store exposed in front of me, on the desk, just for me to touch and feel them. I've never seen such a patient seller. His customer service was from far outstanding. He helped me a lot and I would highly recommend this shop to anybody who would like to buy fabrics in Istanbul. The shop's name is: Bursa Kumas Pazari and the its address is: Koyici Caddesi Buyuk Besiktas Carsisi no:21/303, Besiktas-Istanbul. 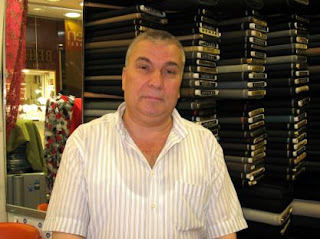 Mr. Suleyman is happy to help you choose the most amazing fabrics. I will return there whenever I need lovely fabrics for my crafty projects.